A new collaborative study led by researchers at Baylor College of Medicine has not only helped to restructure the taxonomy of kidney cancer, it has also uncovered some new actionable therapeutic targets. 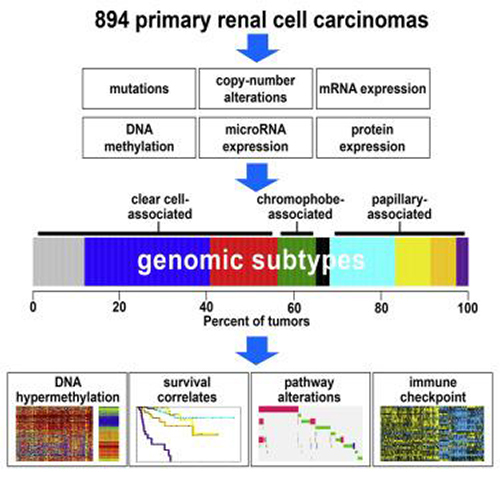 The new study was a comprehensive molecular analysis of almost 900 kidney cancer cases that found substantial molecular diversity within each major histological type that pathologists typically use to categorize cancer. Using data from The Cancer Genome Atlas, the investigators uncovered that what has historically been considered three major types of kidney cancer according to microscopic morphology could be further distinguished into nine major subtypes through molecular analyses. Moreover, each subtype was unique regarding altered molecular pathways and patient survival. The researchers hope that their findings will help pave the way for more effective personalized medicine. Understanding what makes each kidney cancer unique can provide clues to finding targets for effective therapies, and the nine subtypes the research team uncovered were found to have therapeutic implications. Interestingly, the scientists found that the immune checkpoint pathway was most active in a subtype of clear cell kidney cancer that is typically very aggressive. The immune checkpoint pathway can potentially be a target for specific therapies. The researchers were excited by the results of their extensive analysis and hope that their data will be used extensively by investigators in the field to continue advancing their studies of kidney cancer. “Much is going to be learned about kidney cancer with researchers using these data to answer new questions about the disease,” Dr. Creighton stated.